My son asked me to make a valentine card for him to give to his girlfriend - I hope she likes it because I really like her too! The base card is Rich Razzleberry to which I added a layer of the glorious Painted With Love Special Designer Series Paper. 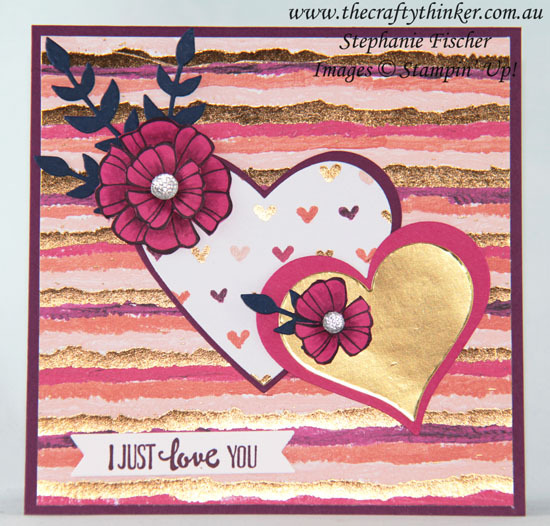 The hearts are cut with the Sweet & Sassy framelits from Rich Razzleberry and Melon Mambo cardstock, Gold Foil Sheet and another piece of the Painted With Love paper. The foliage is cut from Night of Navy scraps of cardstock using one of the Bouquet Bunch Framelit dies. I stamped the flower from the Falling Flowers stamp set three times onto Melon Mambo cardstock with Basic Black ink and used a paintbrush and a little Rich Razzleberry ink to add some shading. I then cut the centre parts from two of the flowers, adhering one part to the main flower to provide depth and the other one to the gold heart as a small flower in its own right. There are some Faceted Gems in the centres of the flowers. 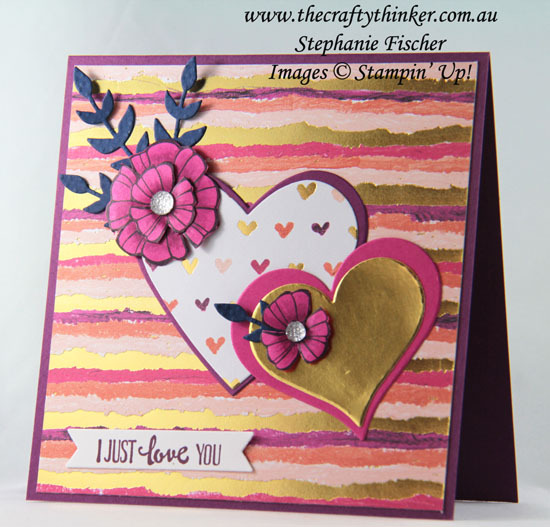 The greeting is from the Petal Palette stamp set. It's stamped with Fresh Fig ink onto Whisper White cardstock which I cut with one of the Bunch of Banners framelits. Your comments are always very welcome!